1. High frequency oscillating knife tool, fast cutting speed, high precision. 2. Adjustable pressure plate tool, effectively prevent the phenomenon of silk being hanged, guarantee the steady cutting. 3. Roll material feeding frame, avoid the falling of roll material, benefit the smooth cutting. 4. Optional kiss cutting function, easy taking down, long using cycle of surface. 5. Perfectly cut 10mm thickness sponge composite skin, completely eradicate the irregular cased by manual work, save material cost. 6. 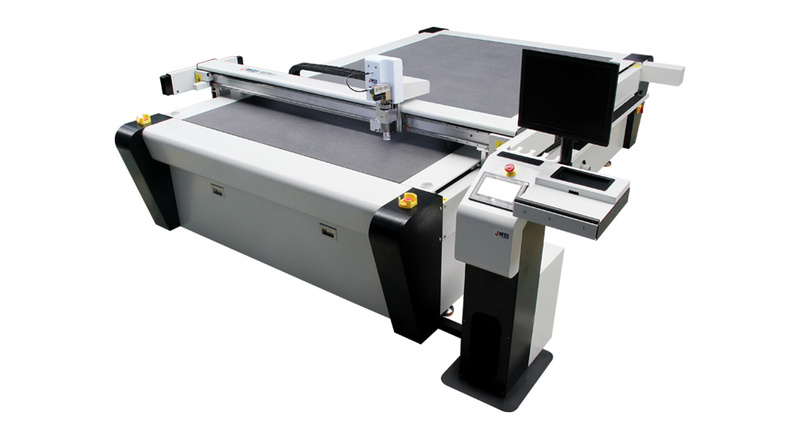 Support national commonly-used DXF, HPGL format, simplify working process. 7. Being connected to several remote computers, realize man-machine separate operation, labor-saving. 8. We accept customize machine size according to customers requirements. Cutting material Car foot mat, Sponge composite skin etc.